The Ys series has been setting the bar for combat and music in action role-playing games since 1987. 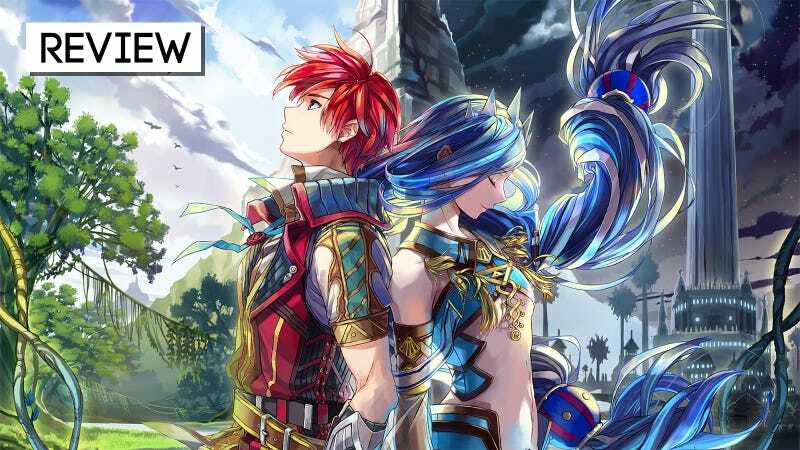 The latest game, Ys VIII: Lacrimosa of Dana, is no different, but it does have something more recent entries have lacked—a memorable story. This post originally appeared 8/30/17. We’ve bumped it up for the game’s release day. Adol Christin is one of the most enduring heroes in gaming. For three decades now the eternally-youthful redheaded swordsman has been hunting for adventure. He’s constantly getting himself embroiled in schemes to destroy the world, fighting dark gods and foiling foul plots. His exploits are the stuff of legend. But Adol exists in a space similar to all classic Japanese action role-playing games, where defeating gods and saving the world are everyday occurrences. His legend is cobbled together from RPG tropes. He’s the hero whose coming was foretold by prophecy. The chosen one of several ancient cultures. He’s even started off one of his adventures suffering from amnesia, which is about as JRPG as you can get. 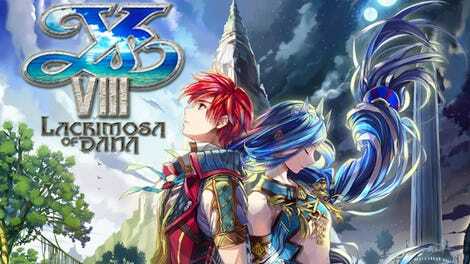 If you’ve played many Ys games, then you know this boat Adol starts off on is doomed. I’ve played through four Ys games over the past 13 years, and I’ve enjoyed each one, but not for the story. I’ve been drawn in by the responsive combat and lulled by the lush music. If you asked me to match the plot of those games to their titles, I would be at a loss. That’s not going to be the case with Ys VIII: Lacrimosa of Dana. It’s something else. Lacrimosa of Dana opens with Adol and his blue-haired companion Dogi aboard a ship called The Lombardia, heading to the continent of Eresia in search of more world-shaking adventure. The trip is cut short when a massive sea creature destroys the vessel, sending Adol plunging into the briny depths. He awakens on the shore of Seiren Island, a cursed place from which legend says no one has ever returned. Traditionally, this would be where Adol stumbles upon an ancient culture and is proclaimed the “the warrior of legend” or some such, but that doesn’t happen. Instead, our hero and other survivors from The Lombardia band together and form a small settlement. Called Castaway Village, it serves as a base of operations for Adol and company as they scour Seiren Island for more survivors and the resources they’ll need to escape. There’s more driving Adol than his relentless thirst for adventure this time around. It’s about survival, not just just for him, but for the growing community of castaways that look to him and his adventuring companions for protection, salvation and comfort. They rely on him. And he relies on them. Each recovered castaway fulfills a role in the ever-growing village. A young woman found wandering dazed on the beach turns out to be a tailor, lending her skills to crafting accessories and outfits for Adol and his friends. A medical student becomes a doctor, brewing potions from resources gathered during the party’s expeditions. There is no money on the island, so a rescued merchant trades more exotic materials for common supplies. So much Ys, so much yes. Yeesh. Tons of exploration, fast and responsive combat, unique story with wonderful characters and lots of little things to see and do. The secondary story is nowhere near as compelling as the first. Logged more than 35 hours in the PlayStation 4 version of the game, playing on normal difficulty. Still have a ways to go. More than stand-ins for the nameless merchants and menders populating standard fantasy RPG towns, each new resident of Castaway Village is a distinctive character. They’ve got stories to tell and quests to give, and by the time they’re done they’ve endeared themselves to the player as surely as if they’d been out in the wilderness fighting by Adol’s side. The plight of the stranded passengers is an incredibly compelling call to adventure. So much so that when Adol begins to dream of a blue-haired girl from a long-dead civilization—the one all over the game’s cover and concept art—it doesn’t feel nearly as important as it should. For a game subtitled The Lacrimosa of Dana (“lacrimosa” is Latin for “weeping”), I really wasn’t feeling the whole Dana thing. Dana is supposed to be the second main character of the game, the first time anyone’s shared top-billing with Adol. The problem in her introduction into the game starts off as a series of dreams that occur right before Adol and fellow fighters Laxia, Sahad, Hummel, and Ricotta are about to do something exciting. With the promise of a new creatures to battle, exotic terrain to explore and the possibility of adding a new face to Castaway Village, the urge to skip these visions is very strong. Where is she from? What is her connection to Adol? He’s probably some sort of chosen one again, whatever. Let’s go rescue some survivors. Dana becomes much more interesting as she’s further integrated into the primary portions of the game, but it takes a while to get there. I’m talking a couple dozen hours here. It sounds like a lot, but there’s so much to do and explore that doesn’t involve a secondary story I’m not all that invested in. There’s a map to fill in, each individual section showing me the percentage explored, treasure chests to be opened and resources to harvest. It takes a lot of jumping and climbing to hit those numbers. The brown on beige maps can be a little hard to follow, which has undoubtedly tacked on extra hours to my play time. The village From time-to-time the village will get raided by beasts, setting in motion an Interception event, pitched battles during which Adol and his companions defend the settlement against waves of invading enemies. There are also Suppression missions, which see the castaways taking the battle against the beasts to the wilderness, keeping the population in check lest they be overrun. You will be acutely aware of every stray water ripple in this game. There are fish to catch, crops to grow, items to craft and meals to cook. A lot of work goes into keeping up a semblance of civilization. Then there’s the pure joy of running about with a trio of adventurers, slaughtering any unfortunate creature that gets in your path. Ys has a knack for fast-paced dynamic combat, and Lacrimosa of Dana is the best it’s ever been. Building off the rock/paper/scissors system introduced in Ys Seven, each of the playable characters does a certain type of damage—slash, strike or pierce. If an enemy has a tough outer shell, Sahad’s massive striking anchor weapon is just the thing to crack it. If an enemy flies, piece its wings with Laxia’s saber. And Adol’s slashing sword is just the thing for getting to the heart of basic beasts. Players swap between the three active characters in their parties on the fly during battles to exploit enemy weaknesses. They switch styles and create combos, with well-timed dodges and guards slowing down time or nullifying damage, opening up enemies to devastating attacks. It’s an intoxicating dance, borderline addictive. So much so that while the game features a fast-travel system that lets Adol and crew warp between save crystals in an instant, I often found myself hoofing it just to wreck more beasts. And where’s there’s dancing, there’s music. The Ys series is lauded for its soundtracks, producing some of the finest scores in gaming. Rather than tell you how good the music in Lacrimosa of Dana is, here’s the 55-track playlist developer Nihon Falcom uploaded to Youtube. It’s gorgeous. Update 8/30: It’s been pointed out to me that the Youtube channel is run by a fan, and is not the development studio’s official channel. You can find Falcom Sound Team jdk’s official releases on iTunes, Google Play, Spotify and Amazon. Satisfying combat and wonderful music are Ys’ bread and butter. the basic components that have carried the series through multiple sequels and remakes over the past three decades. The stories haven’t been strong, but when they’re just a place to hang our hat while jamming and stabbing, it’s not a big deal. Hell, we might have been better off. By adding an enthralling tale packed with rich, engaging characters and an ever-looming man-versus-nature conflict, Nihon Falcom has crafted a game that’s incredibly hard to put down. There are no real “Everything’s okay now, we can rest” moments in Ys VIII: Lacrimosa of Dana. The struggle isn’t over until everyone escapes the island. I’m somewhere between 35 and 40 hours in, and it doesn’t look like I’m getting off anytime soon. That’s fine. I’ve got everything I look for in an action RPG right here. Update 9/5/2017: Since posting the review I have completed the game, and while most of my points stand, the Dana portion of the game picks up steam in the game’s final chapters. The character grew on me to the point that she replaced Adol in my core party. She’s just an incredibly slow starter. Final play time was a little over 70 hours.